If you want to be funnier I can help you. Here’s how. Interested in speech feedback? Preparing for a speech contest? TED Talk? Feeling stuck? Are you wondering if there are opportunities for more laughs in your speech, presentation, or keynote? Worried humor and your topic won’t work together? I will take a deep dive into your signature talk or keynote and share the natural opportunities available to you. 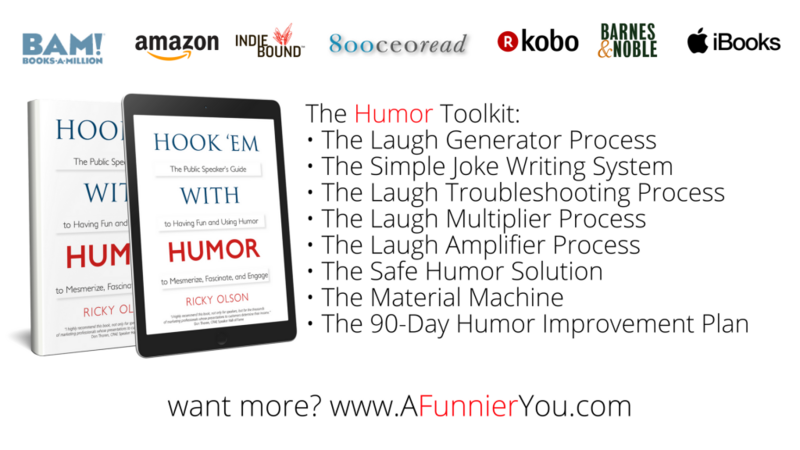 You’ll know where the laugh points are at and how to balance humor with your content to get the optimal result. You’ll send me the video (or link) and a transcript and I’ll review it prior to your session. During our session I’ll share with you specific opportunities for laughs. I’ll also point out opportunities for delivery tweaks and troubleshooting options for missed laughs. No strings or gimmicks. Just specific ideas you can use right away to get more laughs … whether we decide to take the next step or not. Yes, I’m interested in working with you. In this FREE Online training, learn the 5-Step Process for More Laughs in EVERY speech and presentation. This is the actual process I use with my coaching clients to add more laughs to their speeches and presentations. Hook ‘em with Humor Online Course ($997) only $497 for a limited time. The Hook ’em with Humor Online course provides you with a deep dive into the Hook ’em with Humor Toolkit. At your own pace you will receive expert instruction in each of the processes you need to ensure your audience is laughing with you and NOT at you. Are you ready to get the laughs you’re missing every time you speak? Are you also interested in learning the processes to consistently get more laughs? Bigger Laughs? The Hook ‘em with Humor Mentorship is a hybrid program where I will walk you through the steps of adding laughs to your presentation. You will be doing most of the work and I’ll be looking over your shoulder, providing encouragement and feedback. In addition, we’ll look at troubleshooting and delivery so you will be able to consistently get the laughs you want. We will meet twice a month for three months. Working together we will create the consistent laughs you need to entertain and engage your audiences. Plus, you’ll be learning all of my proprietary processes so you’ll be self-sufficient and well-equipped to use the processes over and over with every speech and presentation. The Mentorship includes the full Hook ’em with Humor Online Course along with the Practice Bundle. Click here for details on the course and practice bundle. Are you In A Huge Hurry to get the laughs you’re missing every time you speak? You and I will work together over two days to create the laugh points your wanting. The Hook ’em with Humor Intensive is more about me creating the laugh points and you looking over my shoulder as I use my proprietary processes. We will cover all of the details of humor creation and delivery so you will confidently get the laughs you need and want. The VIP Intensive includes the full Hook ’em with Humor Online Course along with the Practice Bundle. First off, Rick’s coaching program is worth way more than double what I paid! I applied Rick’s humor concepts to my emails on Match.com and I received more responses in 24 hours than I have in 3 months! Amazing! Rick’s coaching is so easy to follow and can be applied outside of online dating. Rick coached me on how to add humor during a first date which helped me connect with women on a completely new level. Rick Olson is AMAZING! I asked him to help me add some humor to a speech I needed to present. I gave him some bullet points. He took my idea and made the speech sound so funny! I delivered it and everyone in the audience loved it, they could not stop laughing. Great success! However, I feel a little guilty. Thank you Rick for an amazing job! Rick has been my mentor in Toastmasters and has a special gift that is the envy of many, including me. That gift is the ability to make people laugh. I have always appreciated his willingness to help me and others to grow as speakers. I can recommend him without any reservation.